Download the Infographic in PDF. Financial institutions strategically aim for customers to do more with mobile while minimizing fraud exposure tied to untrusted, high-risk devices. To enable growth in the mobile channel, financial institutions need to provide fast, convenient and frictionless highvalue services delivered as securely and fraudproof as possible. To achieve this goal, building more trust is Priority One. OneSpan is a global leader in delivering trust and business productivity solutions to the digital market. OneSpan develops next generation technologies that enable more than 10,000 customers in 100 countries in financial, enterprise, government, health care and other segments to achieve their digital agenda, deliver an enhanced customer experience and meet regulatory requirements. 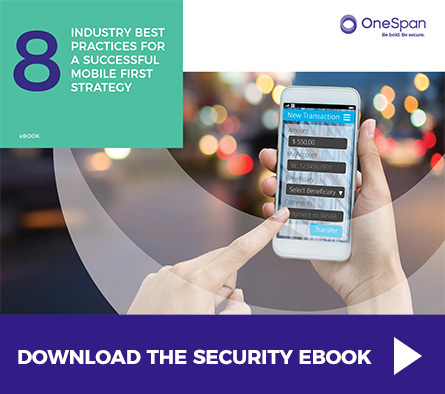 More than half of the top 100 global banks rely on OneSpan solutions to protect their online, mobile and ATM channels. OneSpan’s solutions combine to form a powerful trust platform that empowers businesses by incorporating identity, fraud prevention, electronic signatures, mobile application protection and risk analysis.